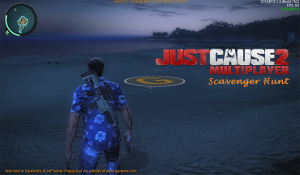 Most of you by now should be fully aware of Gaveroid’s Just Cause 2 Multiplayer Scavenger Hunt. Within the next few days a new hunt will begin. You can easily check to see if a hunt is underway by joining our JC-MP server at jc-mp.gaveroid.com:7777 and pressing F5, if you see a tab called Scavenger Hunt this means for you to start looking as the hunt has begun. We have positioned a large Gaveroid “G” logo at a hidden location somewhere on the Just Cause 2 multiplayer map. Your mission is to travel around Panau and hunt for the hidden logo. When you find the logo, move into it’s radius. It will then change color and a popup box will appear on your screen with instructions on how to claim your prize. The first person to complete these objectives will win the current prize. Please note; just because you find it does not necessarily mean you have won. We will notify you within 48 hours to let you know. This hunt’s prize will be BioShock Infinite for the PC. Please note that this game requires Steam to play. The game listed above is what you will receive through Steam. You will not get credited in any other way for the value of the prize. You will not be able to exchange your prize for another or request it for another platform.